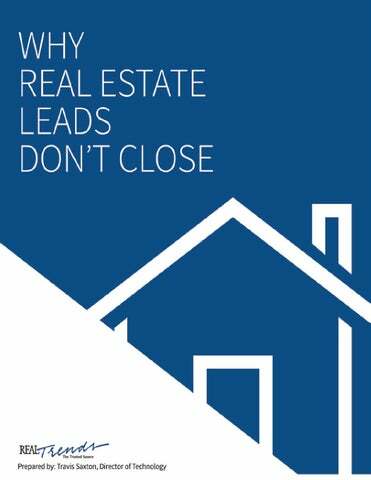 WHY REAL ESTATE LEADS DON’T CLOSE Written by Travis Saxton, director of technology at REAL Trends with guest writers Peter Kempf and Eric Pierce, Co-Founders of Clearview Elite, and York Baur, CEO of Moxi Works Why don’t real estate leads close? This is a million-dollar question for real estate developers, brokers, agents and marketers. The answer is so comprehensive that we could have written a full-length novel on the topic. Instead, we’ll narrow this down and assume the following: •	Your website, real estate office and market are (at the bare min.) functional •	Your sales team speaks the same language(s) as your buyers and sellers •	You have leads that express interest in your real estate offerings If you’ve checked the boxes above, then the answers for getting your organization’s leads closed will lie within the pages of this special report. During this quick read, we’ll uncover the most common lead follow-up mistakes made by real estate sales organizations. Whether you’re a property owner, developer, marketer, broker, sales manager or sales assistant, we want to start you on the right path to moving your leads from interested to genuinely engaged. This special report dissects the reasons why inbound leads, those potential customers who have expressed some interest in a real estate property, do not close. While we will discuss these principles as related to single-family home sales, brokerage business development and commercial real estate sales and leasing; it also applies to neighborhood communities, condominiums and destination resorts. II	BACKGROUND What we discuss in the following pages is based on general sales principles, many of which those in the real estate world don’t follow. If you’ve ever worked in a true sales position, you’ll understand the laser-focus of the sales process. There are goals, quotas, sales stages, call scripts, follow-up requirements, relationship building and more. In real estate, resources are more often focused on lead generation, rather than lead management or lead conversion. Lead generation is critical, and there are plenty of firms and products available to help you create intricate marketing programs to get that inbound traffic flowing. However, in our lead response research, discussions with industry leaders and with secret- shopping real estate websites around the world, we have found that, on average, more than 50 percent of all marketing-generated leads are never contacted by a salesperson. This fact alone leads to lower PROBLEM: marketing ROI for brokers and More than 50% of all marketing agents, not to mention the missed generated leads are never actually opportunities. In other words, spoken with by a sales person. great lead generation efforts are underserved unless your sales team or individual agents have the benefit of a professional process used to engage those leads. First, here is a note about lead generation. The amount of information your public website contains can have a significant impact on the volume and quality of your leads. If all the details about your property are on your public website, then you may expect one or two potentially damaging outcomes: •	There’s nothing left to request. If you include every detail about a home, why would a prospect need to call you? •	There could be plenty of would-be purchasers reviewing the information on their own, without your knowledge. Why are these two scenarios damaging? When interested people draw their conclusions about your product without your assistance, they could totally overlook or misunderstand something. This is especially true for those offering a fractional product that involves explanation-of-use plans and advanced FAQs. Selling real estate is most often accomplished by building a relationship with prospective buyers. This is done on the phone as hearing the tone of your voice is critically important. Once customers understand your personality, emails will become more effective because they can understand your tone of voice based on the information they gleaned over the phone. The alternate theory suggests that you should never hide anything from your website visitors. Why make them jump through hoops to get information they want? Give them what they want, when they want it! This is not entirely accurate. There is a middle ground. The Winning Recipe Provide information, plenty of it, and wrap it with beautiful images and videos. Move your viewer into an advanced level of interest. Leave out a few important, next-level items and require the viewer to give something up to get something in return. What that viewer needs to give up is his or her name, email and phone number—nothing more. Long forms are a deterrent to inbound Internet leads. In a website contact form, for every extra question you ask beyond these three, your bounce rate on that form will increase by 4 to 5 percent, according to REAL Trends research. Key Takeaways •	Selling is about connecting and building rapport, not letting your web viewers make decisions without your help. •	Building rapport can only be done well over the phone or in person. •	Keep several valuable, next-level, sales items for each listing off of your public website. •	Require name, email and phone number to receive next-level information. •	In web forms, tell the viewer what he or she is about to receive, how and when. REAL ESTATE LEADS DON’T CLOSE BECAUSE, IN PART, THE SALES PROCESS BREAKS DOWN EARLY, WHEN YOUR VIEWERS ARE ON YOUR PUBLIC WEB SITE. The alternate strategy is to outsource this to a reputable call center and entrust them with managing the leads or scrubbing them before passing them to your agents. However, when those agents are not solely responsible for selling one property, the result can have a negative impact on sales in several ways, as follows: 1. Important lead response practices get lost in the day-to-day chaos of an independent real estate agent. Independent agents, especially successful ones, are not able to respond at a moment’s notice to an Internet lead or be available for a spur-of-the-moment property tour. A dedicated agent will make it a priority to follow up with new inbound leads and/or walk-ins to a sales office as soon as possible, establishing a connection immediately. 2. A systematic approach. Mandating follow-up and long-term relationship marketing procedures are a must. The image below represents the lifecycle of the real estate lead process and when most leads contact an agent. One of the single biggest reasons that real estate leads don’t close is because they aren’t ready when they reach out to you. 3. Dropping the Ball Effect. This is also known as out-of-sight, out-of-mind. With the longevity of many of these leads, it is common to see real estate professionals only focus on the deals at hand and disregard those in who are not quite ready to buy. 4. Accountability is important. Go beyond a set-it-and-forget-it team mentality. Pertinent KPI’s (Key Performance Indicators) such as lead response time, closing rates, conversion rates, tech savvy, and even availability play a role in maintaining an online lead team member status. The buying & selling process, from initial research to closing, is a long process - about two years, according to our research. Key Takeaways •	Dedicated, on-site agents will respond faster than independent real estate agents to inbound leads for selling a primary home community, condominium or resort community. •	Dedicated, on-site agents will be less inclined than independent real estate agents to refer quickly to another property based on sales objections. •	Sales teams need sales training, must know their product and should follow similar training programs as teams in other industries. •	Sales training should be reinforced periodically. Even the best salespeople get caught up in the daily grind and let strong selling techniques fall to the wayside. Real estate leads don’t close because sales agents aren’t always focused on selling one product and can be distracted by daily duties unrelated to their primary goal. Product focus and sales training will improve the chances of closing more leads. A professional sales process is designed to move a prospective buyer from merely interested to actively engaged, finally resulting in a happy paying client. It should be a structured, detailed and mandatory process that is tracked on a weekly basis. This does not mean that we believe in micro-management. A structured and logical process put in place should help a salesperson or team improve their lead contact rates and overall sales success on its own. They shouldn’t require a manager demanding more phone calls. A good CRM can make your customer service appear exceptional with routine follow-up calls, pertinent emails, long-term marketing and more. In conjunction with Clearview Elite, we designed a 10-stage sales process specifically for selling real estate. The ten stages are listed below. For more detail on each stage, please download: The Elite Sales Process for Real Estate Professionals This professional sales process is based around stages and statuses. These two criteria working together allow the salesperson to understand where each lead is in the sales process and what needs to be done next. It also lets management paint a clearer picture of the brokerage’s revenue forecast. Each stage is vital to the entire process. For example, if you find a lead sitting in Stage No. 1, the most logical explanation is that the sales agent either forgot or couldn’t send the information that was requested. CRMs, Clearview Elite specifically, will automatically send out the information for the sales agent, so the default stage for a new Internet lead can be Stage No. 2. A second example: A new lead can only be set to Stage No. 3 when there has been a live conversation. We define this as either back and forth email conversation, a live phone call or a personal meeting in the sales office. Through previous experience and tracking thousands of leads, Clearview Elite can tie each of these stages with a probability that the lead will close. In general, 3 percent of all real estate leads will end up buying at some point. That percentage increases as you move up the sales process ladder. For our closing probability estimates at each stage, please download our Elite Sales Process for Real Estate Professionals here. Here is a deep dive into the CRM Processes applied to each sales stage: 10 Sales Stages with CRM Functionality Applied 1. Information Requested. Trigger automated response with high-value content to buy you some time. CRM notifies you instantly via text, push notification or email with the contact details to follow up with a personal introduction. 2. Information Sent. Also tracked, and activity is recorded to make you more informed. Some CRMs will interpret this activity and trigger a smart marketing campaign based on the user’s habits or engagement with sent information. 3. Qualification and Discovery. This stage offers an opportunity for you to pull information and use it in your CRM for things such as preferences and family information. The more information you have in the CRM, the more professional you will look in the future. People are impressed when you can remember certain pieces of information, and that creates lasting bonds. Save these notes in your CRM for touchpoints with your clients. 4. Showing Complete. Automating this process, making showing sheets and recording the feedback is another feature of many CRMs. The CRM gives you the ability to see what your customers share and revisit. The questions they ask are an indicator of interest. Having a CRM that notifies you of customer’s habits or changes in patterns is vital. 5. Visit Complete. Staying abreast of new properties that match the consumers’ criteria is another feature of a good CRM. Just because you have completed the first sweep of property showings, don’t think there won’t be others. Keep that same level of service and attentive nature throughout this stage. 6. Final Discussion. It’s time to discuss an offer! This is where a CRM can get you organized. Whether you’re handing it off to a transaction coordinator or following the process yourself, consumers need education and handholding. A great system can make you shine. Stay on top of tasks and necessary information so you can get back to what you do best. This list shows you some of the things a good real estate CRM can do. It’s extremely hard to provide the same level of service to your consumers by rote memory and an email program. A CRM is a core component of a successful real estate agent. In a recent study conducted by Market Leader/Trulia, only 40 percent of the general agent population used a real estate CRM, and those 40 percent were more productive and satisfied with their profession as a whole. REAL Trends recently sampled the top 10,000 real estate professionals, and nearly 95 percent of these top producers used a CRM on a regular basis. Management can now get a better feel for how many leads are being contacted by a salesperson, i.e. having a live conversation. The overall percentage of leads that move to Stage No. 3 will be a strong indicator of how the lead response program is working. If 75 percent of all leads never get past Stage No. 2, then the follow-up practices must be adjusted, and new practices must be put in place. A poor live conversation rate is another reason real estate leads don’t close. A poor conversation rate can lead us to assume one of the following: 1. The lead submitted a phony email and/or phone number 2. The information sent (Stage No. 2) wasn’t impressive enough to engage the lead 3. The sales team wasn’t made aware of the new lead’s inquiry 4. The salesperson didn’t follow up fast enough (See next chapter) 5. The salesperson didn’t make enough attempts to reach the lead Let’s dive down into reason No. 5 a little further. InsideSales.com and the Massachusetts Institute of Technology (MIT) studied lead response in depth. They found that the average salesperson only makes 1.3 phone calls per lead before giving up, which results in wringing only 37 percent of the value of the lead. We believe it’s safe to keep your attempts at six. In addition, space them out, so the lead doesn’t become overwhelmed. Over contacting someone will kill a sale quickly. The goal is for the sales agent’s pipeline to be large enough so that there isn’t enough time to make nine follow up calls in four days! process leads. Today, most agents think of a lead as a person who wants to buy or sell a home right away. If that person doesn’t transact within a relatively short period, such as a few months, then the lead is often forgotten. In reviewing agent performance data across thousands of agents (with millions of contact records) using Moxi Works, it is clear that agents who focus on building a sphere of influence—people who know, like and trust them—tend to be vastly more productive than agents who don’t. In fact, Moxi Works sees agents who embrace this method increase their business by 38 percent. This is because, among other reasons, those people in an agent’s sphere provide a steady stream of repeat and referral business. Knowing this lets agents using a CRM change their goals for new leads from expecting a quick transaction, to gaining a person who knows, likes and trusts them. Agents who work to grow their sphere think about new leads differently: •	They are far less concerned with qualifying a lead based on whether or not they will transact immediately. •	They are more concerned with getting the lead integrated into their ongoing marketing programs powered by their CRM. •	They understand that the people in their sphere will transact with them eventually and also provide them repeat and referral business. •	FOLLOW CLEARVIEW ELITE’S 10-STAGE SALES PROCESS FOR REAL ESTATE •	Stages matched with statuses will help to structure what would otherwise be a chaotic day of follow up. Follow up 6 times to gain 90% of the value from a lead, but don’t do it all in two or three days Real Estate Leads Don’t Close because there is a lack of or a breakdown in a professional sales process designed to help a sales agent navigate through the lifecycle of a lead due diligence process. Leads get missed, forgotten and dropped in the priority scale too soon. Much of this is due to lack of direction and structure and the proper CRM to manage that structure. While these practices might seem logical and easy, they are quite often overlooked in the real estate world. This is because much time and energy is directed towards Lead Generation and very few resources spent on Lead Response. Respond Fast The first two steps you can take to significantly improve your chances of making contact are to deliver the information that is requested instantly and automatically, right when the prospective buyer wants it, and pick up the phone as soon as possible—preferably within five. In the same study by Insidesales. com, merely waiting an extra five minutes beyond the first five reduces your chance of moving these leads to Stage No. 3 by a multiple of five. Then, the time doubles, going from 10 to 30 minutes. In reality, in the residential real estate space, we see an average of eight hours from initial contact to response time from real estate sales professionals. This, coupled with the fact the average consumer expects a response within 45 minutes, creates a service/value gap in our industry. Immediately reaching out, via phone, is critical to your chances of making contact with your new lead. The lead is likely still in the act of perusing your website if you can put in a quick call within minutes of an inquiry. Furthermore, you are still at the top of mind, and there is little chance that a competitor will have established a connection before you if the potential customer is perusing multiple websites. Think about your own personal experience. If you go so far as to enter your contact information online via a form let’s say, all under the guise of wanting to learn more about a given product or service, aren’t you going to be more receptive to talking about it while it is still fresh in your mind? I know I would be. – Steve Olenski, freelance writer, Forbes. Others support this consumer behavior, such as InsideSales.com and REAL Trends, who have researched the demands of web consumers. InsideSales.comâ&#x20AC;&#x2122;s lead response study with MIT revealed that the odds of qualifying a new lead in five minutes versus 10 minutes drops 400 percent. Contact and qualifaction rates drop dramatically in just minutes and continue to decrease over the next few hours. RESPONSE TIME: The moment an interested lead completes a web form until a sales representative contacts them. Take a look at the graph below, courtesy of REAL Trends. It reveals response times by those in the real estate industry. Only 8 out of 100 agents got it right, and almost half of all tested didnâ&#x20AC;&#x2122;t respond at all! Agent Response Time to Internet Inquiries Response times to 100 inquiries submitted through website. All inquiries were on their own listings. Email address provided as way to contact inquiry. What we know through research is not being practiced in the real estate industry. As stated previously, CRMs can help with improving lead response, especially the timing. Many real estate CRMs can set up workflows and use code embedded in web forms to deliver first response emails instantly and automatically. ClearviewElite.com takes lead response a step further and creates elegant, web-based real estate presentations and delivers those instantly and automatically on behalf of the user. Similarly, a boring PDF presentation doesn’t set you apart either. The more impressive your presentation, the more credibility your property receives in the mind of your prospect. Most importantly, the more likely the prospect is to answer your call. Impressiveness and a heightened image in the eye of the prospect can only help you connect. 1. When do you want to put your home on the market? Or, how soon do you want to find ... and buy your new home? 2. Can we start the process this week? Hi, I’m looking for ________ ... Hi ________ my name is ________ ... I’m calling to see ... when you plan on interviewing the right agent for the job of selling your home? 1. If you were to move ... where would you go next? That’s exciting! 2. When would that be? (Three months.) Fantastic! 3. Obviously ... you realize it could take one to three months in this market to get a home sold ... did you know that? (No) Terrific! 4. So…my question is…do you have to be sold in one month… or do you want to start selling at that time? (Sold) Wonderful! 5. Fortunately ... to get you one step closer to ___ ... all we need to do now ... is simply set an appointment ... so I can help you get what you want ... in the time you want ... won’t that be great? Fantastic! 6. Which would be better for you ... Monday or Tuesday at 4 p.m.? (If no) Have a great day... goodbye... click! “Remember the 3, 3, 3, Concept”- For hot leads. As you can see, the real estate coach’s approach is different from the Insidesales. com approach, but still in line with the effort needed to turn this lead into a client. Priority 1: Leads on Property (currently with you or in person) Priority 2: Inbound calls (not emails) Priority 3: New Web Inquiries Priority 4: Late Stage Follow-up Calls (Sales Stages Nos. 5 through 9 for example) Priority 5: Early Stage Follow-up Calls (Sales Stages Nos. 2 through 4 for example) Priority 6: Inbound Email Follow Up Where 90 percent of all salespeople (in any industry) tend to misstep is by placing Priority No. 6 up towards the top of the list. It is vital to respond to inbound emails and answer questions in order to move buyers through their due-diligence process, but it does not trump responding immediately to new inquiries or follow ups. Remember, you’re trying to improve your contact ratio exponentially, and the easiest way to do this is by responding to new inquiries within five minutes whenever possible and adding more follow-up attempts. Key Takeaways: •	Making contact with new leads is half the battle. •	Making contact with new leads isn’t especially easy but can improve if you respond fast, respond well and respond often. •	Our research indicates that salespeople speak to no more than 50 percent of inbound leads. •	Send requested information instantly and automatically. Waiting for lead assignment and manually responding is a timewaster and a deal killer. •	Spend the money on web-based tools to create impressive presentations for your property, send those presentations out instantly and find out who is opening them and when. •	Salespeople respond to leads only 1.4 times on average. Bumping that up to nine times will get 90 percent of the value from leads. •	Prioritize your day around the importance of speedy response to new inquiries. Real estate leads don’t close, in large part, because there is a lack of awareness surrounding lead response management in the real estate industry. Therefore, there is a lack of urgency in getting back to new leads. Too many other to-dos get prioritized ahead of calling back new leads. Real estate leads don’t close because the sales process breaks down early, when your viewers are on your public website. •	Selling is about connecting and building rapport, not letting your web viewers make all decisions on without your help. •	Building rapport can only be done well over the phone or in person. •	Keep several valuable, next-level sales items off your public website. •	Require name, email and phone number to receive next-level information. •	In web forms, tell the viewer what they are about to receive, how and when. Real estate leads don’t close because sales agents are not focused on selling one product and are distracted by other daily duties unrelated to their primary goal. Product focus and sales training will improve the chances of closing more leads. •	Dedicated, on-site agents will respond faster than independent real estate agents to inbound leads for selling a primary home community, condominium or resort community. •	Dedicated, on-site agents will be less inclined than independent real estate agents to refer quickly to another property based on sales objections. •	Sales teams need sales training, must know their product and should follow similar training programs as teams in other industries. •	Sales training should be reinforced periodically. Even the best salespeople get caught up in the daily grind and let strong selling techniques fall to the wayside. Real estate leads don’t close because there is a lack of or a breakdown in a professional sales process designed to help a sales agent navigate through the lifecycle of a lead due diligence process. Leads get missed, forgotten and dropped too soon. Much of this is due to lack of direction and structure and a failure to have the proper CRM to manage that structure. •	The sales process should be structured, mandatory and monitored weekly by management to ensure the process is being followed properly. •	There are a ton of CRMs available. Many of them will help by providing structure around the sales process. •	A CRM for real estate breakdown is in the works. •	FOLLOW CLEARVIEW ELITE’S 10-STAGE SALES PROCESS FOR REAL ESTATE •	Stages matched with statuses will help to structure what would otherwise be a chaotic day of follow up. •	Follow up six times to gain 90 percent of the value of a lead, but don’t do it all in two or three days. Real estate leads don’t close because there is a lack of or a breakdown in a professional sales process designed to help a sales agent navigate through the lifecycle of a lead due diligence process. Leads get missed, forgotten and dropped too soon. Much of this is due to lack of direction and structure and a failure to have the proper CRM to manage that structure. Real Estate Leads Don’t Close, in large part, because there is a general lack of awareness surrounding lead response management in the real estate industry and therefore a lack of urgency in getting back to new leads. Too many other to-dos get prioritized ahead of calling back new leads. •	Making contact with new leads is half the battle. •	Making contact with new leads isn’t especially easy but can improve if you respond fast, respond well and respond often. •	Our research indicates that salespeople speak to no more than 50 percent of inbound leads. •	Send requested information instantly and automatically. Waiting for lead assignment and manually responding is a timewaster and a deal killer. •	Spend the money on web-based tools to create impressive presentations for your property, send those presentations out instantly and find out who is opening them and when. •	Salespeople respond to leads only 1.4 times on average. Bumping that up to nine times will get 90 percent of the value from leads. •	Prioritize your day around the importance of speedy response to new inquiries. Travis Saxton is the director of technology at REAL Trends and managing partner of the technology consulting team. He is also the author of several special reports and annual studies such as the REAL Trends Online Performance Study. 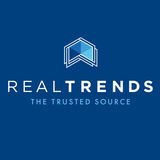 The REAL Trends technology team assists brokerages and top teams with their technology and digital marketing needs. The technology team also supports and aids real estate technology companies with sales channel development, lead generation, and product development and thought leadership. To find out more about the REAL Trends technology team, visit realtrendstechnology.com Eric Pierce is the founder of Clearview Elite LLC. Clearview Elite is a real estate sales and marketing company offering next-generation digital listing and property presentations to real estate professionals to improve lead response practices and increase lead engagement rates for luxury real estate developers, sales teams and brokers. York Baur is the chief executive officer of Moxi Works, makers of the Moxi Works Real Estate Sales Productivity system, integrating an entire brokerage to increase agent productivity. Moxi Works is the only real estate technology built around sphere-selling methodology. The system compares an agentâ&#x20AC;&#x2122;s income goal to current activities and automates a set of prioritized tasks to ensure they do the right thing at the right time, driving more sales.